I do a lot of group work in my classroom. Over the years I have developed this form for students to fill out at the end of each class period spent working in a group. 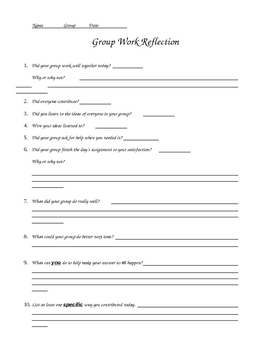 At the beginning of each year I take the time to look at the form with the students as I am setting up group work and use it as tool to set my expectations for them during group time. As the students are getting used to filling out the form, it can be time consuming, taking 15-20 minutes for some of them to complete. But as they get used to the questions (and my expectations) through daily use, they get faster, and most can fill one out thoroughly in under five minutes. It has become an invaluable tool for me to get the students' perspectives on how their group has functioned during the class period, and who to pay extra attention to as group work progresses. Once students are used to using this form it helps with group management as well because they know they will need to identify their contribution to the group and their group members will report back on whether or not everyone contributed or help was sought when needed.